The recent surge in food with a middle eastern flare is evident. Shawarma stands and restaurants have popped up all over Ontario. I don’t doubt that at some point a Shawma Wars show will appear on CMT beside the battles between burgers, pizza and tacos. Until then. the battle for the best shawrma has to be left to the likes of numerous Toronto blogs and celebrities like John Catucci. So, when I was peckish for a pita, Dr. Laffa seemed a logical choice. Although located in an industrial area around Dufferin and Lawrence (actually there is a second location on Bathurst located across from Harold the Jewelry Buyer of commercial fame), it is a bustling joint even on a Sunday. Dr. Laffa has been featured on You Gotta Eat Here and has been crowned with the title of Toronto’s best shawrma by BlogTo a few years back. Upon entry, I was surrounded by smiling waitstaff and seated in the back corner. I got there just prior to the lunch rush and narrowly avoided the arrival of a large birthday party which filled half of the seats in the modestly sized interior. The menu gives a loose description of the restaurant’s concept which essentially equates laffa bread with manna from heaven itself. Baked fresh to order, It’s sort of a cross between pita and naan bread. It is available with hummus orders as well as an option for any of the sandwiches. 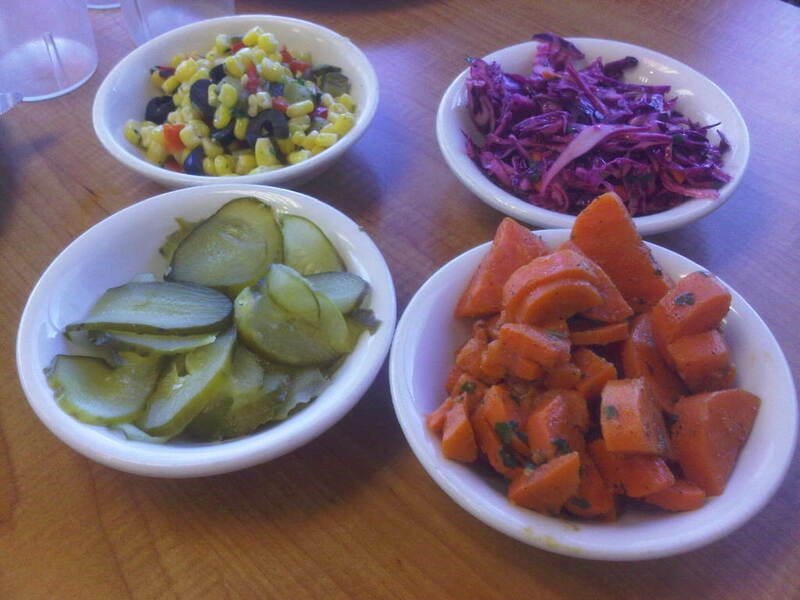 We were immediately treated with a spread of condiments which included pickles, cabbage, corn salad and carrots. My favourite was the cabbage although they were all pretty tasty. Ordering turned out to be quite the ordeal. The word “shawarma” on a menu can imply a number of different things. Both myself and my daughter are fans but we both have an aversion for lamb. I inquired into the content of the shawarma and after great deliberation by numerous members of the waitstaff, I was told it contained both lamb and chicken and it appeared there was no way to change this fact. Both of us called an audible and ordered the falafel and chicken shish kabob sandwiches respectively. 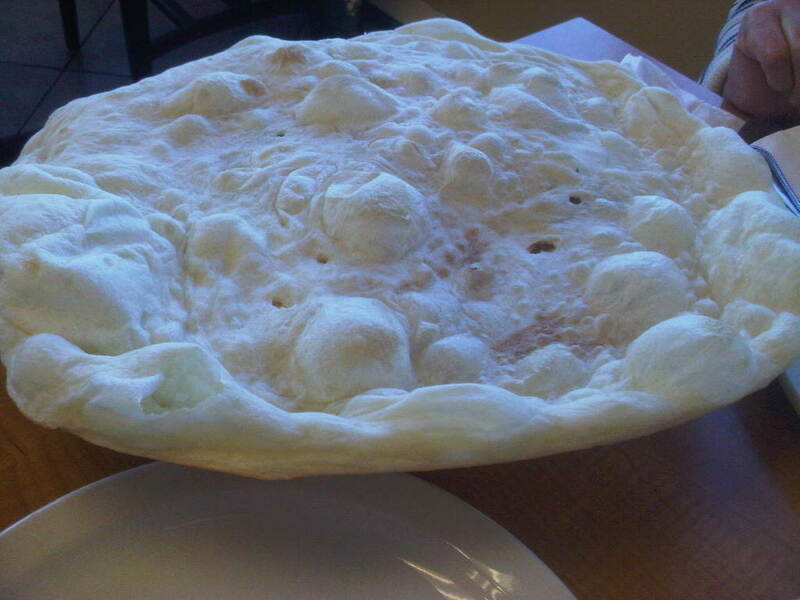 I decided to break the bank and go for the laffa whereas my daughter played it safe with the pita. 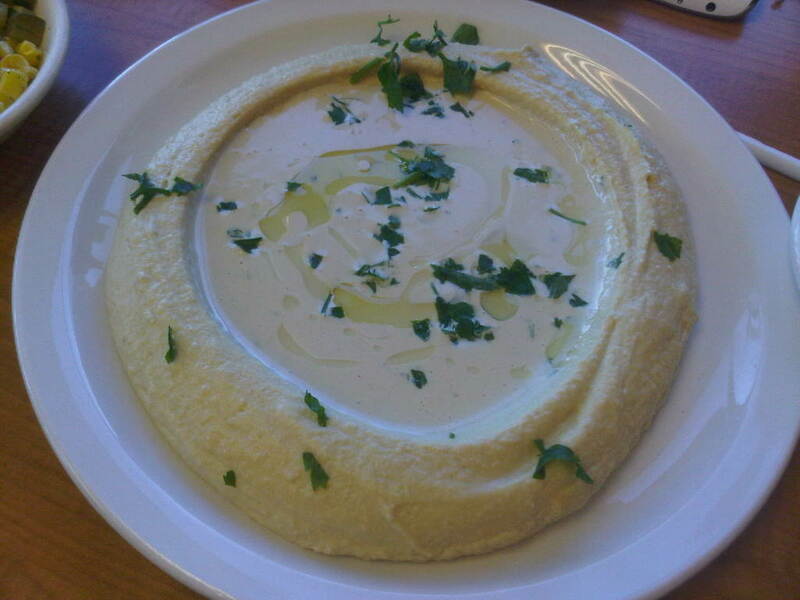 I started with the hummus masabaha (chickpeas and tahini). It was a rather large portion served with one piece of laffa. Creamier than most, it had a mild, pleasant flavour. If you like an earthy, garlicky dip you may be a bit disappointed. Be prepared to be left with a whole lot of hummus as well since the amount of bread is not nearly enough. I decided to take a stroll to the counter to check out the open kitchen. It was at this point I realized that a chicken shawarma was possible (I had initially assumed that the lamb and chicken was stacked on the same stick). I explained to the guy that we were told otherwise and asked if we can switch. He looked at me rather perplexed but reluctantly agreed….or so I thought. Back at the table, I updated the waitress. Sure enough, out come the kabab laffa with the explanation “well, it wasn’t in the computer and he didn’t know which one to switch”. There was no offer to remedy. Furthermore, she didn’t order the laffa to begin with! She was stuck with a laffa instead of a pita (for an extra $3 a pop for chicken laffa I’ll add). I would have almost forgiven the whole ordeal if the sandwich would have been mind blowing. The plaque on the wall boasting Dr. Laffa’s commitment to the importance of pickled turnips, hummus and hot sauce as a key component of a shawarma was misleading because what was sitting in front of us was a sloppy mess of hummus-laden lettuce and huge chunks of onion overpowering the chicken and falafel. Although the chicken wasn’t dry and the falafel was moist and nicely seasoned, the sourness of the pickle and heat of the sauce were near absent. 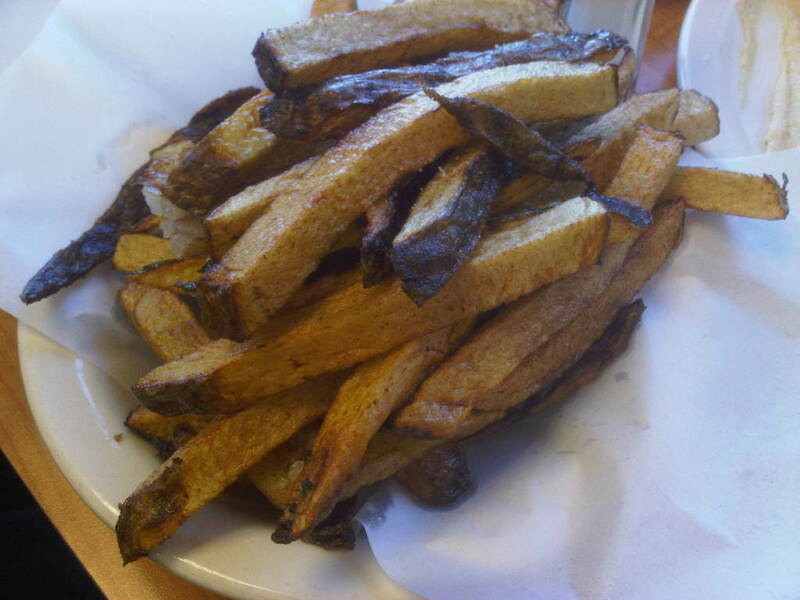 My son ordered fries for $4.99. They were fresh cut and ample ketchup was available so he was happy. At this point the birthday party had pretty much arrived and we were left stranded for a while. Eventually, we were asked if we wanted to take the sandwiches home and the waitress carefully wrapped them table side which was a nice touch. After another lengthy wait we were given the bill and navigated our way out. Despite the dismal dining conditions that exist in London Ontario, there are many great middle eastern choices. I can grab a decent shawarma on almost every corner. 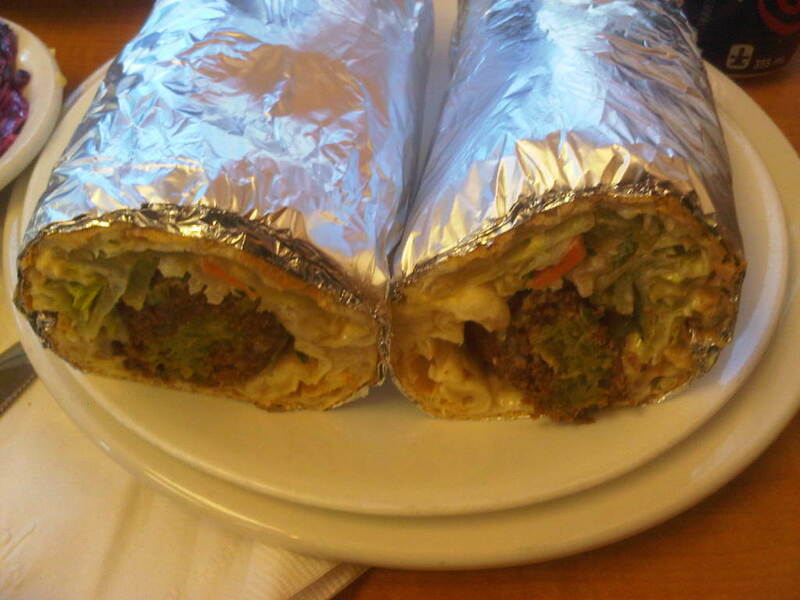 If Dr. Laffa is the best shawarma in Toronto, then London wins hands down. I don’t expect Michelin star service in places like this but I get rather annoyed when simple things go wrong. The ability to provide a simple chicken shawarma on a pita to a 13 year old does not seem like an impossible feat but proved to be so on this day. It lacked the fundamental elements of a good sandwich that I though would be automatic in a place raved about on You Gotta Eat Here and Blogto. My falafel was decent but not heads and tails above others I have had. Some patrons have commented that the laffa should not be a dollar and a half to three dollars more than the pita but I suspect it is bigger in general given the amount of filling necessary to stuff the plate-sized bread (this is a theory I never got to test out since I never got a pita to compare it to). Otherwise, the hummus was good and the starting “treats” were a nice touch. Despite everything, the place was packed, so there appears to be no shortage of fans. In the end, I went to the doctor but I didn’t leave laffing.